Soccer faithfuls won’t change Parramore’s fortunes by themselves, [Florida State University professor Tim Chapin] said. Draft Global Beer Lounge, despite taxpayer subsidies, fell into debt before closing at the Church Street Parking Garage, which has since been torn down, while Parramore mainstay Johnson’s Diner also failed after moving into the CityView building. Commissioner Regina Hill, a Parramore native who represents the neighborhood on the City Council, credits a job at the old Amway Arena, which opened in 1989 and was demolished in 2011, with offering her hope as a young woman. “It was $7-an-hour, part-time, but it gave me the ability to get off that couch and start to feel valuable,” she said. Now there’s a headline: “Sports facilities bring hope to low-income communities with minimum-wage part-time jobs to get them off the sofa.” Accuracy is so seldom clickbaity. Howard Handler, the league’s chief marketing officer, said the number of comp tickets distributed has declined by an average of 20% over the last two years. It now accounts for about 9% of announced attendance, he said. Yet even if that figure is correct, it still would mean more than 663,000 tickets included in the MLS crowd count for 2016 were given away. And even that math doesn’t always add up. Just look at Orlando City, one of five teams whose attendance was surveyed for this story. The club claimed home attendance of 532,500 this season at Camping World Stadium although the City of Orlando, which owns the facility, released figures Friday that showed the number of tickets scanned — the modern-day equivalent of a turnstile count — was 151,060 short of the team’s total, a difference of 8,886 per game. What this means for MLS’s economic viability is above my pay grade, though given that many players aren’t paid much more than the league minimum of $51,000, they’re probably doing pretty okay. It does help explain why the league is so dead-set on expanding until the cows come home, though: It’s way easier to make money selling expansion franchises for $200 million a pop than selling tickets $3 at a time to fans who may or may not exist. Anyway, this is indeed a scam, though it’s one that is by no means limited to Orlando’s soccer stadium (which is otherwise being funded entirely out of da Silva’s pocket), and one that’s more about how developers have sweet-talked the federal government into getting them access to cheap capital by bumping certain foreigners with money to the front of the immigration line. Team officials haven’t said how much they’re expecting to raise by this method (they say they have $15 million so far), but keep in mind it’s just a no-interest loan, not a grant, so while da Silva would be saving money, he’s still be on the hook for the principal. It’s worth getting upset about, in other words, but less because da Silva is applying for it than because it still exists at all. The team will now operate the stadium, not the city, meaning it will cover operating expenses but also won’t share revenues. The team’s non-relocation clause has been cut from 15 to ten years, and it will no longer pay a $20 million fine if it moves before then. The city is still on the hook for sewer and infrastructure upgrades that could amount to $16 million, which will wipe out the $9 million profit the city will turn on the land it bought and re-sold to Orlando City S.C. Under the previous deal, the club was going to pay $675,000 in annual rent; by owning the stadium itself it won’t pay rent but will pay property taxes, but those will likely amount to less than the rent would have. Under the new contract, Orlando City S.C. can deduct future construction cost overruns from the $18 million purchase price it’s paying the city for stadium land. So how bad is all this? Not real bad, honestly: Operating costs can easily outstrip any revenues. The non-relocation clause is likely a non-issue if the team owns the stadium and would be saddled with it if it moved. Sewer costs are a standard city expense that property taxes are supposed to help cover. And most importantly, that “rent” wasn’t going to pay back the city and county’s $40 million in construction costs under the old deal, but toward paying back a $10 million loan that the city was going to provide toward the team’s share. The most salient item uncovered by Turner is that the $18 million land purchase price may get eaten up by cost overruns, which is a real concern. But even then, getting a lousy price on land sales is a perfectly cromulent tradeoff for getting out from under $40 million in taxpayer cash obligations. The Orlando City soccer deal may not be the stadium utopia we had hoped for, but it’s at least close, and much closer than the original deal that the team owners originally proposed. I may not be quite shocked and awed by it, but if all stadium deals looked like this one, the world would be a significantly better place. [A] lawsuit claims that since the city of Orlando used eminent domain to acquire the land, it needed to follow certain steps before selling it. They claim in the lawsuit the city owned the property less than 10 years, the city didn’t allow the original owners to repurchase their land and the city did not open up bidding for the land. Orlando previously tried to use eminent domain to take land from a church for the soccer stadium, but instead gave up and moved the stadium a block over. One piece of the new property was acquired by eminent domain, though, and state law prohibits selling it to a private entity for ten years afterwards; Orlando officials claim they’re not selling that one parcel to the soccer team (presumably they’re just granting an easement to build the stadium on top of it), and anyway court rulings allow private development to be a public purpose, so neener neener. It’s entirely possible that the whole transaction will be ruled legal, but still, this seriously harshes my buzz. Why oh why can’t we have nice things? I’m sure that given enough time and data on land values in Orlando, I (or someone else) could pick apart fair market value for the city property that will now be turned over to the soccer club. (Not to mention the $11 million the city has spent on cleanup and site prep, and whether that’s typical or a special consideration for a project like this.) But for now, let’s just enjoy for a moment that a professional sports franchise is actually agreeing to pay to build its new stadium, and pay (something) for the land to build it on, and pay property taxes on the stadium once it’s complete — you know, like regular people do when they own property. It shouldn’t be remarkable, but it is, and we should bookmark it as an example that things can sometimes be different. Why this happened in Orlando is complex — part city government that was resistant to coughing up public money, part rich foreign owners who just wanted to get a team in place and didn’t care much about dickering over a few tens of millions in subsidies — and not necessarily easily transferrable to other cities. 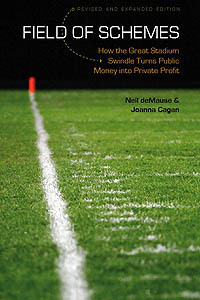 But even a glimpse at a possible future where new sports stadiums are treated like private investments, not public necessities so that private owners can earn more profits, is enough for me, for today at least. Team owner Flávio Augusto da Silva announced Friday the franchise will privately finance the construction of its downtown soccer-specific stadium. The stadium, originally envisioned and pitched as a city-owned venue, will now be owned and operated privately by Orlando City. Wait, what? The same Orlando City S.C. that got $40 million in city and county subsidies two years ago? And which was demanding another $30 million from the state? Suddenly da Silva found $70 million in his other pair of pants, and now he doesn’t need public money after all? In addition to privately financing the stadium, which officials said is expected to cost more than the originally-projected $115 million, Orlando City will buy back the stadium land from the city. There are a few possibilities here. One is that it is Christmas, or maybe the Rapture, and from now on sports team owners will decide that asking the public to pay their bills is just wrong, so from now on we’ll be paying construction bills and our taxes alike! A related, slightly less implausible scenario is that the Orlando City owners decided that they’d lose a pile of money if they didn’t break ground soon and had to delay their stadium’s opening, so throwing in $70 million in cash plus the cost of land plus property taxes until the end of time is totally worth it. Or — and I’m sure some of you have thought of this already — maybe there’s another shoe to drop. I’m not sure what this would be (the da Silva press statement doesn’t leave a lot of loopholes for hidden subsidies, though having the city somehow cover operating costs would be one possibility), but there are a lot of suspicious factors here: The notion of a sports team owner willingly giving up already-approved subsidies, for one, but also the timing of this announcement on a Friday afternoon, when there’s little time for journalists to research WTF he’s on about before having to file their stories (and web videos) and head home for the weekend. And unfortunately, I can’t do much better than that today, other than to raise a skeptical eyebrow and plan on following up on Monday. In the meantime, I certainly hope this is for real, and not one of those hoaxes that the kids today like to put over on gullible journalists. Back when the city of Orlando and Orange County approved $40 million in subsidies for Orlando City S.C. in 2013, it was supposed to be enough to cover the cost of an $85 million soccer stadium, with plans to add more bells and whistles — more luxury seating, a second “executive club,” and more advertising boards — if $30 million in additional state tax breaks came through. Now, though, with site prep for the stadium still in the early stages, Orlando Mayor Buddy Dyer is suddenly saying the state sales tax rebate is “integral” to the project, and without it … something. Something bad. You can’t really blame Dyer, since it’s not his money that’s at stake here — I mean, it is his citizens’ money, since they’re Florida taxpayers, but it doesn’t come out of his budget — so it makes sense for him to pull out all the stops to lean on the state legislature to approve the cash. One would hope that state legislators would instead look at the facts that past state sports subsidies have only returned 30 cents on the dollar and that the Orlando project is only promising to create 60 jobs and politely decline Dyer’s demands, but this is Florida, so probably not. Orlando City S.C. may want to increase the size of its new soccer stadium because the club just played its first ever MLS game, and sold 62,000 tickets for it. Because certainly 62,000 people turning up at the Citrus Bowl shows that you could never draw 62,000 fans if the team played at, say, the Citrus Bowl. Team execs are saying the new stadium could go as high as 28,000 seats, which would be the largest MLS soccer-specific stadium, Fox 35 reports. If any of them said anything about increased cost or how it would be paid for, Fox 35 can’t be bothered to tell you that.